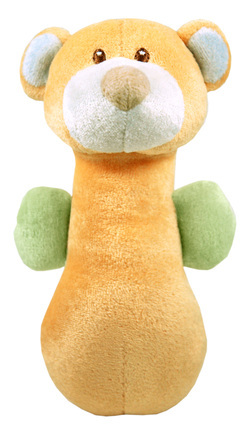 Twice as Nice… BambooZoo Bear Soft Shaker is a rattle that doubles as a huggable friend! Velvety soft toy in a chunky style that’s easy to grasp. Paws & ears are tough enough for tugging & teething. And of course it’s a rattle, too. Shake up some Fun! Orange Sherbet Bear Shaker is ready for wiggles and giggles. 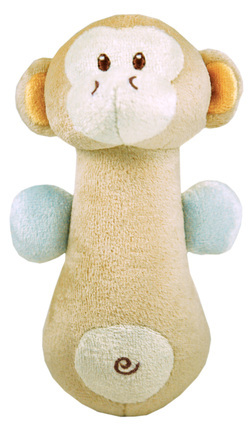 Twice as Nice… BambooZoo Monkey Shaker is a rattle that doubles as a huggable friend! Velvety soft toy in a chunky style that’s easy to grasp. Hands & ears are tough enough for tugging & teething. And of course it’s a rattle, too. Shake up some Fun! Vanilla Bean Monkey Shaker is ready for wiggles and giggles.